For the automobile part, see fuel pump. "Gas pump" redirects here. For the similarly named film, see Gas Pump Girls. A pump, manufactured by Dresser Wayne, in Greece. A fuel dispenser is a machine at a filling station that is used to pump gasoline, petrol, diesel, CNG, CGH2, HCNG, LPG, LH2, ethanol fuel, biofuels like biodiesel, kerosene, or other types of fuel into vehicles. 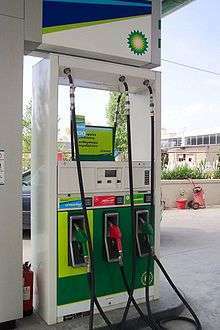 Fuel dispensers are also known as bowsers (in Australia), petrol pumps (in Commonwealth countries), or gas pumps (in North America). The first gasoline pump was invented and sold by Sylvanus Bowser in Fort Wayne, Indiana on September 5, 1885. This pump was not used for automobiles, as they were not yet being sold. It was instead used for some kerosene lamps and stoves. He later improved upon the pump by adding safety measures, and also by adding a hose to directly dispense fuel into automobiles. For a while, the term bowser was used to refer to a vertical gasoline pump. Although the term is not used anymore in the United States, except as a term for trucks that carry and dispense fuel to large aircraft at airports, it still is used sometimes in Australia and New Zealand. The first fuel dispenser was patented by Norwegian John J. Tokheim in 1901. Fuel retail industry giant Tokheim-OPW, was named after him. Many early gasoline pumps had a calibrated glass cylinder on top. The desired quantity of fuel was pumped up into the cylinder as indicated by the calibration. Then the pumping was stopped and the gasoline was let out into the customer's tank by gravity. When metering pumps came into use, a small glass globe with a turbine inside replaced the measuring cylinder, but assured the customer that gasoline really was flowing into the tank. In some cases the actual pump may be sealed and immersed inside the fuel tanks on a site, in which case it is known as a submersible pump. In general, submersible solutions in Europe are installed in hotter countries, where suction pumps may have problems overcoming cavitation with warm fuels or when the distance from tank to pump is longer than a suction pump can manage. In modern pumps, the major variations are in the number of hoses or grades they can dispense, the physical shape, and the addition of extra devices such as pay at the pump devices and attendant "tag" readers. Light passenger vehicle pump flow rate ranges up to about 50 litres (13 US gallons) (11 gallons) per minute (the United States limits this to 10 US gallons (38 litres) per minute); pumps serving trucks and other large vehicles have a higher flow rate, up to 130 litres (34 US gallons) per minute in the UK, and airline refueling can reach 1,000 US gallons (3,800 litres) per minute. Higher flow rates may overload the vapor recovery system in vehicles equipped with enhanced evaporative emissions controls (required since 1996 in the US), causing excess vapor emissions, and may present a safety hazard. Historically, fuel dispensers had a very wide range of designs to solve the mechanical problems of mechanical pumping, reliable measurement, safety, and aesthetics. This has led to some popularity in collecting antique dispensers, especially in the USA. Nozzles are attached to the pump via flexible hoses, allowing them to be placed into the vehicle's filling inlet. The hoses are robust to survive heavy wear and tear, including exposure to weather and being driven over, and are often attached using heavy spring or coil arrangements to provide additional strength. A breakaway valve is also fitted to the hose to allow the nozzle and hose to break off and fuel flow to be stopped in the case a vehicle drives off with the nozzle still in the filler, although this is largely prevented today by the point-of-sale systems not allowing payment for fuel until the nozzle is returned to its petrol pump holder. The nozzles are usually color-coded to indicate which grade of fuel they dispense, however the color-coding differs between countries or even retailers. 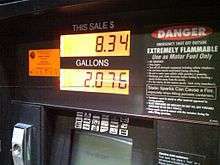 For example, a black hose and handle in the UK indicates that the fuel dispensed is diesel, and a green dispenser indicates unleaded fuel; the reverse is true in the US. Some different types of fuel have specially sized of nozzles to prevent accidentally filling a tank with an incompatible fuel. The nozzle on diesel pumps is supposed to be larger so that it cannot fit into the fillpipe on a vehicle tank designed for gasoline. However, the larger diameter diesel nozzles are not an actual requirement, and many diesel pumps at auto islands have been fitted with standard gasoline nozzles. Also, the nozzle for leaded gasoline is wider than for unleaded, and the fillpipe on vehicles designed for unleaded-only was made narrower to prevent "mis-fueling". Some diesel fuel tanks are designed to prevent wrong type of nozzle to be used. In some countries, pumps are able to mix two fuel products together before dispensing; this is referred to as blending or mixing. Typical usages are in a "mix" pump to add oil to petrol for two-stroke motorcycles, to produce an intermediate octane rating from separate high and low octane fuels, or to blend hydrogen and compressed natural gas (HCNG). The benefit of blending for retailers is that it allows them to offer 3 grades of fuel while only having to maintain inventory of two grades. This frees up both working capital and tank capacity and improves fuel turnover. One of the most important functions for the pump is to accurately measure the amount of fuel pumped. Flow measurement is almost always done by a 4 stroke piston meter connected to an electronic encoder. In older gas pumps, the meter is physically coupled to reeled numerical displays (moving wheels or cylinders with numbers on the side), while newer pumps turn the meter's movement into electrical pulses using a rotary encoder. In the U.S. flow speed is limited to 10 gallons per minute for cars and 40 gallons per minute for trucks. This flow rate is based on the diameter of the vehicle's fuel filling pipe, which limits flow to these amounts. Gasoline is difficult to sell in a fair and consistent manner by volumetric units. It expands and contracts significantly as its temperature changes. A comparison of the coefficient of thermal expansion for gasoline and liquid water at 20°C indicates that the volume of gasoline changes at about 4.5 times the rate of water. In the United States, the National Institute of Standards and Technology (NIST) specifies the accuracy of the measurements in Handbook 44, though states set their own legal standards. The standard accuracy is 0.3%, meaning that a 10-US-gallon (37.9 L) purchase may actually deliver 9.97 US gal (37.7 L) to 10.03 US gal (38.0 L). The reference temperature for gasoline volume measurement is 60°F or 15°C. Ten gallons of gasoline at that temperature expands to about 10.15 US gal (38.4 L) at 85 °F (29 °C) and contracts to about 9.83 US gal (37.2 L) at 30 °F (−1 °C). Each of the three volumes represents the same theoretical amount of energy. In one sense, ten gallons of gasoline purchased at 30°F is about 3.2% more potential energy than ten gallons purchased at 85°F. Most gasoline is stored in tanks underneath the filling station. Modern tanks are non-metallic and sealed to stop leaks. Some have double walls or other structures that provide inadvertent thermal insulation while pursuing the main goal of keeping gasoline out of the soil around the tank. The net result is that while the air temperature can easily vary between 30 and 85 °F (−1 and 29 °C), the gasoline in the insulated tank changes temperature much more slowly, especially in underground tanks, as deep soil temperature tends to remain in a narrow range throughout the year, regardless of air temperature. Temperature compensation is common at the wholesale transaction level in the United States and most other countries. At the retail consumer level, Canada has converted to automatic temperature compensation, and the UK is undergoing conversion, but the United States has not. Automatic temperature compensation, known as Standard Temperature Accounting in the UK, may add a tiny amount of additional uncertainty to the measurement, about 0.1%. There are far fewer retail outlets for gasoline in the United States today than there were in 1980. Larger outlets sell gasoline rapidly, as much as 30,000 US gal (110,000 L) in a single day, even in remote places. Most finished product gasoline is delivered in 8,000- to 16,000-gallon tank trucks, so two deliveries in a 24-hour period is common. The belief is that the gasoline spends so little time in the retail sales system that its temperature at the point of sale does not vary significantly from winter to summer or by region. Canada has lower overall population densities and geographically larger gasoline distribution systems, compared to the United States. Temperature compensation at the retail level improves the fairness under those conditions. In the United States, each of the 50 states has a Department of Weights and Measure, with the authority to perform all testing and certification, issuing fines for non-compliance. For example, in 2007 Arizona found that 9% of all pumps were at off by at least 2.5% (the threshold for fines), evenly split between overcounting and undercounting fuel. In some regions, regular required inspections are conducted to ensure the accuracy of fuel dispensers. For example, in the U.S. state of Florida, the Florida Department of Agriculture and Consumer Services conducts regular tests of calibration and fuel quality at individual dispensers. The department also conducts random undercover inspections using specially designed vehicles that can check the accuracy of the dispensers. The department issues correction required notices to stations with pumps found to be inaccurate. Most other US states conduct similar inspections. In Canada, inspections are regularly conducted by the federal government department Measurement Canada. Inspection dates and test results are required, by law, to be displayed on a sticker on fuel dispensers for consumers to see. Under a recently proposed legislation by the House of Commons (C-14: Fairness at the Pumps Act), fines for a vendor with a modified fuel dispenser or poorly maintained dispenser would be up to $50,000. However, virtually all pumps that fail inspection in Canada do so for general calibration errors caused by use over time. Intentional modification for the purpose of deceiving consumers is extremely rare. The hydrogen fuel dispensers in use on hydrogen stations dispense the fuel by the kilogram. In the United States, the National Institute of Standards and Technology (NIST) specifies the accuracy of the measurements in Handbook 44. The current accuracy is specified at 2.0%. Worldwide regulations are discussed under OIML R 139 (compressed hydrogen). The technology for communicating with gas pumps from a point of sale or other controller varies widely, involving a variety of hardware (RS-485, RS-422, current loop, and others) and proprietary software protocols. Traditionally these variations gave pump manufacturers a natural tie-in for their own point-of-sale systems, since only they understood the protocols. The shut-off valve was invented in Olean, New York in 1939 by Richard C. Corson. At a loading dock at the Socony-Vacuum Oil Company, Corson observed a worker filling a barrel with gasoline and thought it inefficient. The sound of a toilet flushing later gave him the idea for a "butterfly float." After developing a prototype with his assistant, Paul Wenke, Corson gave the suggestion to the company who later filed for a patent in his name. The initial intent of the device was to "allow a person to fill more than one barrel [of gasoline] at the same time." This mechanism eventually developed into the modern gasoline pump cut-off valve. Most modern pumps have an auto cut-off feature that stops the flow when the tank is full. This is done with a second tube, the sensing tube, that runs from just inside the mouth of the nozzle up to a Venturi pump in the pump handle. A mechanical valve in the pump handle detects this change of pressure and closes, preventing the flow of fuel. A modern fuel pump will often contain control equipment for the vapor recovery system, which prevents gasoline vapor from escaping to the air. In the UK for example any new forecourt with a predicted throughput in excess of 500 m3 per month is required to have active vapour recovery installed. Fuel pump in Vienna, Austria. A 1991 photograph of a fuel pump in Ömossa village, Kristinestad, Finland. Antique fuel pump in Quillan, France. Antique diesel fuel pump located at Roscheider Hof Open Air Museum, Konz, Germany. Display of various antique fuel pumps at Deutsches Museum in Munich, Germany. Old Soviet Union fuel pumps. Antique "Mobilgas" pumps, manufactured by Tokheim, located in Wilton, Connecticut, USA. Antique gasoline pump from Savannah, Georgia, USA. 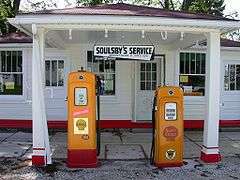 Two types of Shell gasoline pumps at Soulsby Service Station in Mount Olive, Illinois, USA. Four old-fashioned gasoline pumps at the 2012 Greater Milwaukee Auto Show. Since fuel dispensers are the focal point of distributing fuel to the general public, and fuel is a hazardous substance, they are subject to stringent requirements regarding safety, accuracy and security. The exact details differ between countries and can depend to some extent on politics. For example in countries fighting corruption, such as Mexico, gas pumps may be more stringently monitored by government officials, in order to detect attempts to defraud customers. Typically, individual pumps must be certified for operation after installation by a government weights and measures inspector, who tests that the pump displays the same amount that it dispenses. Measurement Canada is the federal agent responsible for pump regulations in Canada and stickers are displayed on the pumps. Hydrogen fuel dispensers are regulated under SAE Standard (J2601). Unicode 5.2 introduces the symbol ⛽ (U+26FD FUEL PUMP) to the Miscellaneous Symbols set. It is representable in HTML as &#x26FD; or &#9981;. ↑ Mark Gwynn (October 2005). "When people become words" (PDF). Ozwords. Australian National Dictionary Centre. But one doesn’t have to be an Australian to enter the Australian lexicon — take bowser ‘petrol pump’ (in Australia), which is named after a company established by U.S. inventor and entrepreneur S.F. Bowser. ↑ Alfred, Randy (2008-10-01). "Sept. 5, 1885: Pay at the Pump". Wired.com. Retrieved 2011-12-10. 1 2 3 "Certificate Pursuant to section 12 of the Weights and Measures Act 1985" (PDF). ↑ "The EPA 10 gallon per minute fuel dispensing limit". U.S. Environmental Protection Agency. 1997-09-24. Retrieved 2016-04-20. ↑ Austerman, Gary (May 1997). "How Large Aircraft Fuel Up". Petroleum Equipment & Technology Archive. ↑ "California Refueling Emission Standards and Test Procedures for 1998 Through 2000 Model Motor Vehicles" (PDF). August 5, 1999. ↑ Caldwell, Dave (October 5, 2008). "Filling Up the Backyard With a Gas Station". The New York Times. Retrieved May 3, 2010. ↑ "Handbook 44". National Institute of Standards and Technology. 1 2 "STA Guidance" (PDF). Feb 2016. ↑ "Bureau of Petroleum Inspection". Florida Department of Agriculture and Consumer Services. Retrieved 2011-12-10. ↑ IFSF Management Intro, sec 1.1 Background history Archived August 24, 2005, at the Wayback Machine. ↑ "Patent US2316934 - Barrel Filler". Google.com. Retrieved 2011-12-10. ↑ Sampson, Julia (April 26, 2010). "Did you know? Gas Pump shut-off valve was invented in Olean". Olean Times Herald. ↑ "12/25/1991 How does a gas pump shut off automatically when the gas tank is full?". Pa.msu.edu. Retrieved 2011-12-10. ↑ Plueddeman, Charles. "Unraveling Automotive Mysteries". Editorial.autos.msn.com. Retrieved 2011-12-10. ↑ Dickerson, Marla; Martinez, Carlos (2006-06-13). "Not Quite Measuring Up at Mexico's Gas Pumps". Los Angeles Times. Retrieved 2011-12-10. Wikimedia Commons has media related to Petrol pumps. Hosed at the Pumps: an Ottawa Citizen investigation into Canadian fuel pump accuracy, with a searchable database on inspection records. By journalists Glen McGregor, Jessey Bird, Doug Schmidt, and Barb Pacholik. Tanker distribution center in China Exhibition Chinese brand tanker and accessories.